A new 10MW solar array is set to be built in New York City, boosting the city’s solar energy capacity by 50%. 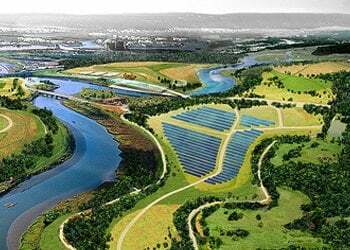 Located on 45 acres of land at Freshkills Park, a former landfill site on Staten Island (artist’s impression, pictured), it will generate enough clean electricity to power around 2,000 homes. It is part of the PlaNYC initiative, the city’s long term sustainability plans, which include a goal of replacing all street lights with energy efficient LED lighting by 2017. SunEdison, which is to build and run the solar plant will install between 30,000 to 35,000 solar panels on two sites in the park.